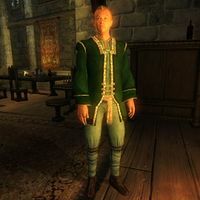 Lazare Milvan is a Breton noble who lives in a large house in Skingrad. He is a wealthy and arrogant man who thinks that the player is of low birth. Lazare leads a secluded and relaxing life. He wakes up at 6am every morning, and spends most of the day wandering around his house. At 8pm he takes a two hour supper, before going to bed at midnight. He wears typical upper class clothing: a green brocade doublet with matching green silk garment and green velvet shoes. He carries a silver longsword, a sizable amount of gold, leveled jewelry, and his key. When you first meet Lazare, he will say: "You have obviously made a mistake. Sir Lazare Milvan would never speak with someone of your low birth. You are obviously of low birth. Unless you dispute my judgement... and you would press your suit at the end of a sword." To which you may reply by denying his claim of your origins: "I am not of low birth." Or you can excuse yourself from the conversation by saying; "Excuse me." If you chose the former he will reply by demanding that you leave or that you fight him in a duel: "You contradict me. This conversation is tiresome. Leave me. Or draw your sword." If you chose the latter he will claim that you must leave if you wish to live: "I'm afraid I cannot. Leave me, and I will spare you." Speaking to him again after your initial encounter will reveal that he has not changed his attitude towards you, which is evident when he greets you with: "You are talking again. You will stop." He will then exit out of conversation. "I heard Lazare Milvan challenged someone else to a duel. The man is ridiculous." "He's a moron. One of these days, he'll be taught a lesson." "I've had about enough of Sir Lazare. He thinks he's so much better than everyone else." "What a fool. I hope he's happy with himself." Although he challenges you to a duel, attacking him still counts as a crime. Lazare’s house key is not assigned to his bedroom door, causing him to wander around all night. Esta página foi modificada pela última vez à(s) 00h21min de 9 de março de 2015.